The novelty of this work is to propose a new process consisting to the modification of triple superphosphate (TSP) by sodium nitrate (NaNO3) for the preparation of a heterogeneous catalytic support Na2Ca(HPO4)2 (calcium hydrogen disodium phosphate). This product has been characterized by X-ray diffraction (XRD), scanning electron microscopy (SEM) and infrared spectroscopy (IR). The catalytic activity of Na2Ca(HPO4)2 was examined in Knoevenagel condensation between 4-chlorobenzaldehyde and malononit rile as a model reaction. The optimization of the reaction operating conditions was carried out based on a study of the effect of various parameters, namely reaction time, the catalyst charge, the nature, and volume of solvent on the reaction yield. From these considerations, this catalyst proves its efficiency since it allows to obtain the product with excellent yields in a short reaction time. Moreover, it has been reused several times without any significant loss of its activity. The process developed herein can be considered as an ecological and economical method because the catalyst used is non-toxic, cost-effective and easy to prepare. - D. T. Mowry, The knoevenagel condensation of aryl alkyl ketones with malononitrile, J. Am. Chem. Soc., 1945, 67, 1050–1051. - X. Garrabou, B. I. M. Wicky, D. Hilvert, Fast knoevenagel condensations catalyzed by an artificial schiff-base-forming enzyme, J. Am. Chem. Soc., 2016, 138, 6972–6974. - B. D. Dhorajiya, B. Z. Dholakiya, Green chemistry multicomponent protocol for formylation and knoevenagel condensation for synthesis of (Z)-5-arylaminomethylene pyrimidine 2, 4, 6-trione derivatives in water, Green Chem. Lett. Rev., 2014, 7, 1–10. - S. Guiheneuf, L. Paquin, F. Carreaux, E. Durieu, T. Roisnel, L. Meijer, J.-P. Bazureau, New 5-ylidene rhodanine derivatives based on the dispacamide a model, Mol. Divers., 2014, 18, 375–388. - L. E. Polander, S. Barlow, B. M. Seifried, S. R. Marder. A 2,6-diformylnaphthalene-1,8:4,5-bis(dicarboximide): synthesis and knoevenagel condensation with malononitrile, J. Org. Chem., 2012, 77, 9426–9428. - R. A. Kudirka, R. M. Barfield, J. M. McFarland, P. M. Drake, A. Carlson, S.Bañas, W. Zmolek, A. W. Garofalo, D. Rabuka, Site-specific tandem knoevenagel condensation–michael addition to generate antibody–drug conjugates, ACS Med. Chem. Lett., 2016, 7, 994–998. - L. H. P. Teixeira, C. A. M. Fraga, E. J. Barreiro, Synthesis of new 1,2-benzothiazin-3-one derivatives designed as dual cyclooxygenase-2 and 5-lipooxygenase inhibitors, J. Braz. Chem. Soc., 1998, 9, 119–130. - T. J. N. Watson, S. W. Horgan, R. S. Shah, R. A. Farr, R. A. Schnettler, C. R. Nevill, F. J. Weiberth, E. W. Huber, B. M. Baron, M. E. Webster, K. Mishra Rajesh, L. Harrison Boyd, L. Nyce Phillip, L. Rand Cynthia, T. Goralski Christian, Chemical development of mdl 103371: an N -methyl- D -aspartate-type glycine receptor antagonist for the treatment of stroke †, Org. Process Res. Dev., 2000, 4, 477–487. Synthesis and electroluminescent property of poly(p-phenylenevinylene) s bearing triarylamine pendants, Polymer, 2005, 46, 3767–3775. Schpector, E. R. T. Tiekink, J. A. R. Rodrigues, P. J. S. Moran, Knoevenagel condensation of aromatic aldehydes with ethyl 4-chloro-3-oxobutanoate in ionic liquids, J. Braz. Chem. Soc., 2012, 23, 825–830. knoevenagel condensation of aromatic aldehydes with malononitrile or ethyl cyanoacetate in the presence of ctmab in water, Synth. Commun., 2001, 31, 673–677. - Y. Ogiwara, K. Takahashi, T. Kitazawa, N.
Sakai, Indium(III)-catalyzed knoevenagel condensation of aldehydes and activated methylenes using acetic anhydride as a promoter, J. Org. Chem., 2015, 80, 3101–3110. aromatic aldehydes with active methylene compounds using a catalytic amount of iodine and k2co3 at room temperature, Synth. Commun., 2007, 37, 2209–2213. cyanoacetic esters and the mechanism of the knoevenagel reaction, J. Am. Chem. Soc., 1937, 59, 2327–2330. of cyclic ketones with benzoylacetonitrile and N,N′-dimethylbarbituric acid. Application of sterically hindered condensation products in the synthesis of spiro and dispiropyrans by hetero-diels–alder reactions, Tetrahedron, 2011, 67, 1422–1431. knoevenagel condensation of aromatic ketones with malononitrile, Arkivoc, 2004, 2004, 4–8. - A. V. Narsaiah, A. K. Basak, B. Visali, K.
Nagaiah, An eco‐friendly synthesis of electrophilic alkenes catalyzed by dimethylaminopyridine under solvent‐free conditions, Synth. Commun., 2004, 34, 2893–2901. Guanidine-catalyzed henry reaction and knoevenagel condensation, Catal. Commun., 2008, 9, 2077–2079. chloride as a new catalyst for knoevenagel condensation, Tetrahedron Lett., 1991, 32, 5821–5822. ions in organic synthesis. Part XVI. knoevenagel condensations of aldehydes and tosylhydrazones with 2,4-pentanedione by copper (II) chloride-catalyzed reaction, Synth. Commun., 1983, 13, 1203–1208. 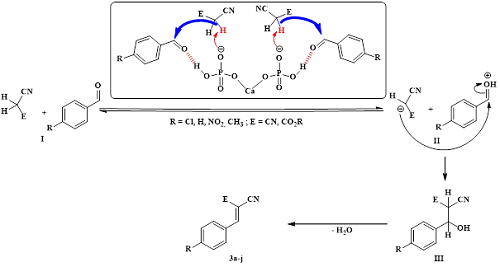 knoevenagel condensation catalyzed by LaCl3 .7H2O in heterogeneous medium #, Synth. Commun., 2003, 33, 3825–3832. P. Galzerano, P. Melchiorre, L. Sambri, Magnesium perchlorate as efficient lewis acid for the knoevenagel condensation between β-diketones and aldehydes, Tetrahedron Lett., 2008, 49, 2555–2557. - S. Saravanamurugan, M. Palanichamy, M.
Hartmann, V. Murugesan, Knoevenagel condensation over β and Y zeolites in liquid phase under solvent free conditions, Appl. Catal. Gen., 2006, 298, 8–15. - L. Martins, K. M. Vieira, L. M. Rios, D.
Cardoso, Basic catalyzed knoevenagel condensation by FAU zeolites exchanged with alkylammonium cations, Catal. Today., 2008, 133–135, 706–710. - B. M. Reddy, M. K. Patil, K. N. Rao, G. K.
Reddy, An easy-to-use heterogeneous promoted zirconia catalyst for knoevenagel condensation in liquid phase under solvent-free conditions, J. Mol. Catal. Chem., 2006, 258, 302–307. Montmorillonite KSF as an inorganic, water stable, and reusable catalyst for the knoevenagel synthesis of coumarin-3-carboxylic acids, J. Org. Chem., 1999, 64, 1033–1035. - M. L. Kantam, A. Ravindra, C. V. Reddy, B.
Sreedhar, B. M. Choudary, Layered double hydroxides-supported diisopropylamide: synthesis, characterization and application in organic reactions, Adv. Synth. Catal., 2006, 348, 569–578. - Q. Li, S. Jiang, S. Ji, M. Ammar, Q. Zhang, J.
Yan, Synthesis of magnetically recyclable ZIF-8@SiO2@Fe3O4 catalysts and their catalytic performance for knoevenagel reaction, J. Solid State Chem., 2015, 223, 65–72. Fe3O4@SiO2 magnetic microspheres for knoevenagel condensation, Chin. J. Catal., 2014, 35, 21–27. Amino-functionalized Zr(IV) metal–organic framework as bifunctional acid–base catalyst for knoevenagel condensation, J. Mol. Catal. Chem., 2014, 390, 198–205. - H. Keipour, A. Hosseini, M. A. Khalilzadeh, T.
Ollevier, Ultrasound-promoted knoevenagel condensation catalyzed by KF-clinoptilolite, Lett. Org. Chem., 2015, 12, 645–650. functionalization of graphene oxide with ethylenediamine as a solid base catalyst for knoevenagel condensation reaction, Catal. Commun., 2015, 64, 105–109. - X. L. Zhao, K. F. Yang, Y. P. Zhang, J. Zhu, L.
W. Xu, Sevelamer as an efficient and reusable heterogeneous catalyst for the knoevenagel reaction in water, Chin. Chem. Lett., 2014, 25, 1141–1144. Hamid, V. R. Choudhary, S. K. Bhargava, Thermally decomposed mesoporous nickel iron hydrotalcite: an active solid-base catalyst for solvent-free knoevenagel condensation, J. Colloid Interface Sci., 2015, 441, 52–58. efficient and eco-friendly catalyst for knoevenagel condensation, Tetrahedron Lett., 2014, 55, 2612–2617. - M. O. Abba, V. M. Gonzalez-DelaCruz, G.
Colón, S. Sebti, A. Caballero, In situ XAS study of an improved natural phosphate catalyst for hydrogen production by reforming of methane, Appl. Catal. B Environ., 2014, 150–151, 459–465. Reaction temperature controlled selective hydrogenation of dimethyl oxalate to methyl glycolate and ethylene glycol over copper-hydroxyapatite catalysts, Appl. Catal. B Environ., 2015, 162, 483–493. Ashrafi, E. Rezaee Seresht, F. Moeinpour, A. Khojastehnezhad, R. Tayebee, Caesium carbonate supported on hydroxyapatite-encapsulated Ni0.5 Zn 0.5 Fe2 O4 nanocrystallites as a novel magnetically basic catalyst for the one-pot synthesis of pyrazolo [1,2-b]phthalazine-5,10-diones: nanocatalyst for synthesis of pyrazolo[1,2-b]phthalazine-5,10-diones, Appl. Organomet. Chem., 2015, 29, 290–295. nanoparticles (HAP NPs): a green and efficient heterogeneous catalyst for three-component one-pot synthesis of 2,3-dihydroquinazolin-4(1H)-One derivatives in aqueous media, New J. Chem., 2016, 40, 447–457. - S. A. R. Mulla, S. S. Chavan, M. Y. Pathan, S.
M. Inamdar, T. M. Y Shaikh, Ligand-, base-co-catalyst-free copper fluorapatite (CuFAP) as a versatile, ecofriendly, heterogeneous and reusable catalyst for an efficient homocoupling of arylboronic acid at ambient reaction conditions, RSC Adv., 2015, 5, 24675–24680. doped with potassium fluoride and modified with sodium nitrate: efficient catalysts for the knoevenagel condensation, Tetrahedron Lett., 2002, 43, 1813–1815. E. Holt, Na2CaP2O7, a new catalyst for knoevenagel reaction, Catal. Commun., 2001, 2, 101–104. - Z. Benzekri, K. El Mejdoubi, S. Boukhris, B.
condensation, synth. Commun., 2016, 46, 442–451. - I. Bahammou, A. Esaady, S. Boukhris, R.
Ghailane, N. Habbadi, A. Hassikou, A. Souizi, Direct use of mineral fertilizers MAP, DAP, and TSP as heterogeneous catalysts in organic reactions. Mediterr. J. Chem., 2016, 5, 615–632. - Y. Merroun, S. Chehab, T. Ghailane, S.
Boukhris, R. Ghailane, N. Habbadi, A. Hassikou, B. Lakhrissi, A. Souizi, An effective method to synthesize 2,3-dihydroquinazolin-4(1H)-One using phosphate fertilizers (MAP, DAP and TSP) as green heterogeneous catalysts, J. Turk. Chem. Soc. Sect. Chem., 2018, 303–316. - S. Sibous, T. Ghailane, S. Houda, R. Ghailane, S.
Boukhris, A. Souizi, Green and Efficient Method for the Synthesis of 1,5-Benzodiazipines Using Phosphate Fertilizers as catalysts under free solvent., Mediterr. J. Chem., 2017, 6, 53-59. A. Hassikou, A. Souizi, Green and efficient phosphate fertilizers DAP, MAP and TSP as catalysts for the synthesis of 1H-pyrazolo[1,2-b]phthalazine-5,10-diones under solvent-free condition, J. Tunis. Chem. Soc., 2017, 19, 89–93. A. Hassikou, A. Souizi, Easy synthesis of 3,4-dihydropyrimidin -2-(1h)-ones using phosphate Fertilizers MAP, DAP and TSP as efficient catalysts, J. Turk. Chem. Soc. Sect. Chem., 2017, 477–488. A. L. Bail, Structure of Na2Ca (HPO4)2 Determined Ab Initio from Conventional Powder Diffraction Data. Eur. J. Solid State Inorg. Chem., 1997, 34, 937–946. knoevenagel condensation catalyzed by PEG400 and anhydrous K2CO3 without solvent, Synth. Commun., 2004, 34, 2965–2971. - S. Balalaie, M. Bararjanian, S. Hekmat, P.
Salehi, Novel, efficient, and green procedure for the knoevenagel condensation catalyzed by diammonium hydrogen phosphate in water, Synth. Commun., 2006, 36, 2549–2557. Ca(H2PO4)2·H2O, monocalcium phosphate monohydrate, via monetite from brushite by using sonication, Ultrason. Sonochem., 2013, 20, 948–954. - K. Nasri, C. Chtara, C. Hassen, M. Fiallo, P.
Sharrock, A. Nzihou, H. El Feki, Recrystallization of industrial triple super phosphate powder, Ind. Eng. Chem. Res., 2014, 53, 14446–14450. of calcium dihydrogen phosphate monohydrate (Ca(H2PO4)2·H2O) obtained by a rapid precipitation route in aqueous and acetone media, J. Alloys Compd., 2009, 482, 199–202. and thermal behavior of calcium dihydrogen phosphate monohydrate (Ca(H2PO4)2•H2O) obtained by a rapid precipitation route at ambient temperature in different media, J Optoelectron Biomed Mater., 2009, 1, 115–123. - J. B. M. de ResendeFilho, G. P. Pires, J. M. G.
de Oliveira Ferreira, E. E. S. Teotonio, J. A. Vale, Knoevenagel condensation of aldehydes and ketones with malononitrile catalyzed by amine compounds-tethered Fe3O4@SiO2 nanoparticles, Catal. Lett., 2017, 147, 167–180. - H. M. A. Hassan, R. F. M. Elshaarawy, S. K.
Dey, I. Simon, C. Janiak, Microwave-assisted hydrothermal fabrication of magnetic amino-grafted graphene oxide nanocomposite as a heterogeneous knoevenagel catalyst, Catal. Lett., 2017, 147, 1998–2005. a reusable solid base catalyst for knoevenagel condensation reaction, J. Colloid Interface Sci., 2017, 485, 75–80. - N. Zohreh, M. Tavakolizadeh, S. H. Hosseini, A.
Pourjavadi, C. Bennett, Tungstate-loaded triazine-based magnetic poly(bis-imidazolium ionic liquid): an effective bi-functional catalyst for tandem selective oxidation/knoevenagel condensation in water, Polymer, 2017, 112, 342–350. Graphene based material as a base catalyst for solvent free aldol condensation and knoevenagel reaction at room temperature, J. Mol. Catal. Chem., 2014, 394, 66–73. carbon nitride as an effective solid base catalyst for knoevenagel condensation reactions, J. Mol. Catal. Chem., 2013, 372, 105–113.